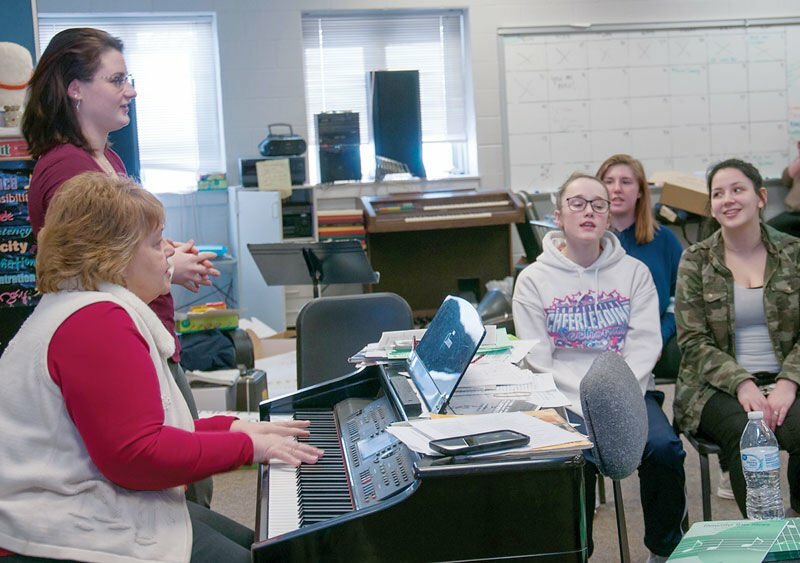 Dianna Leigh will not take over as Cerro Gordo music teacher until this fall, but was able to work with recently retired longtime music instructor Pamella Grohman at a rehearsal last month in Cerro Gordo. Grohmann and Leigh are pictured upper left, and rehearsing with students in the photo at right. However, now the district has hired a brand new soon to be college graduate from Millikin University for the position. Grohmann returned for one final time this semester as the teacher the district hired is still completing her student teaching requirements. Dianna Leigh is currently student teaching at Springfield High School. 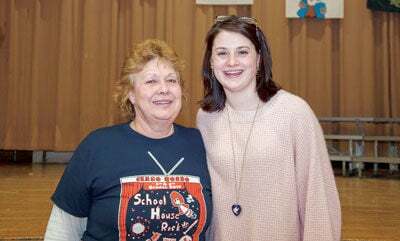 Monday, March 4th, middle school and high school students got the chance to work with her and Grohmann. Leigh also attended the last performance in Cerro Gordo Middle School Gymnasium, which is now closed for renovations. Soon, the gym will become an auditorium. She also has ideas for keeping students involved in music,“Especially grabbing the middle schoolers when they start thinking music isn’t cool anymore, I already have thoughts in my brain for what I want to do for a musical next year.” She added she would like to possibly include the younger grades in the high school musicals and teach them a bit of theory before heading off to college. As for her advice to anyone considering pursuing Music Education, “Oh my gosh, totally do it.